I did a lot of preparation, some of it actual chess preparation but most of it involving finding a hotel, locating the venue, printing out maps, that sort of thing. None of this stopped me getting lost after missing a turn just outside Sitges - not the last thing I was to miss that day - and taking about half an hour or so to get back to where I'd gone wrong. We then briefly looked for the venue on the way into Sitges - without success - before parking, finding our hotel, having a very swift lunch and then heading back to the venue. Or not. 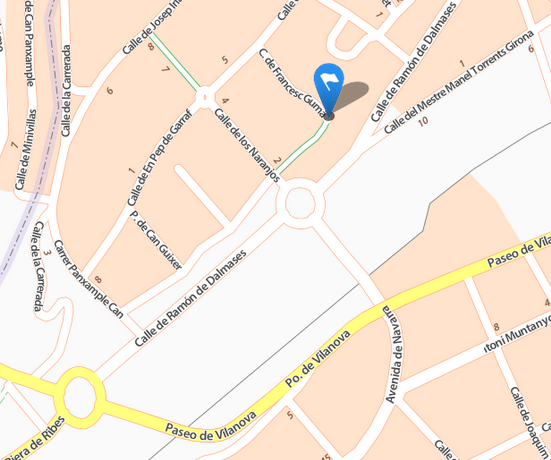 According to the tournament leaflet the venue was in a street named after one Francesc Gumà. so it was a surprise not to find the venue when we first looked for it and a bigger surprise to walk down the passage indicated and find that it was actually dedicated not to a relatively obscure nineteenth-century industrialist and politician but to an extremely famous artist. But the greatest surprise was to be told by a couple of passers-by that our venue was actually in the city centre - where we'd just come from - as you can see from the map below, indicating as it does the supposed location, according to viamichelin.com, and the actual location, according to reality. We drove back into town. Fast. 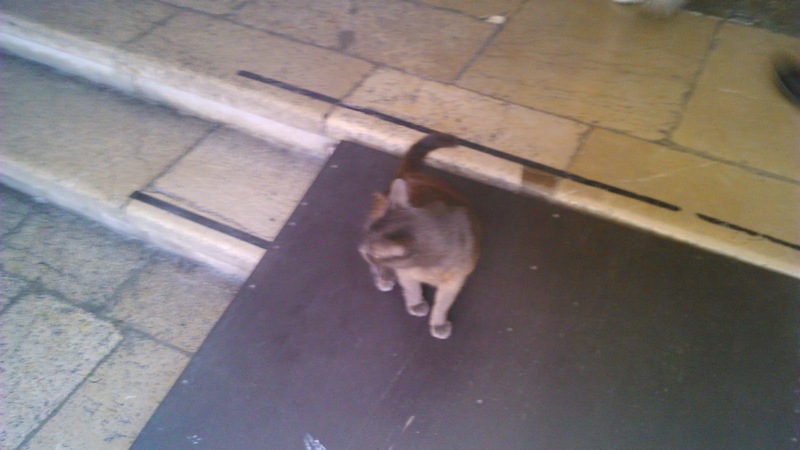 Putting the car into an expensive underground car park and scooting into the centre, we were able to find the venue with a few minutes to spare, giving me just time to fill in my scoresheet and then come back and take a photo of the official tournament cat, who was sat in the foyer before almost every round. The photo is a little blurred: and possibly the poor puss felt that way, since some clown had trodden on it about a minute before I took the shot. It was that kind of day. 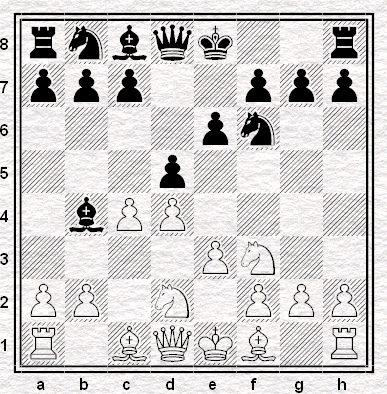 I found a move so bad that after playing it I immediately resigned. 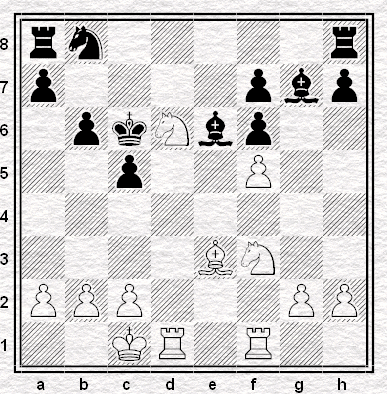 Five moves: my fastest defeat, I think, in nearly forty years playing competitive chess. It was that kind of day. But meanwhile, what of Jonathan? I'd headed straight off to the expensive underground parking to retrieve the car, parked a few minutes' walk away in the street and returned to the tournament hall on the expectation that he would still be playing. But no - his chair was empty, the chair opposite his was similarly unoccupied and the pieces were ready for the next game. but although the position is well short of from resignable, his mobile phone, by going off, brought the game to an immediate end. It really was that kind of day. 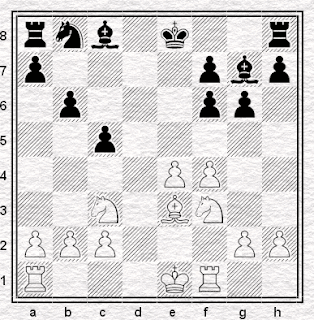 Although Black's move is flagged as a serious error by some tree databases, the previous two players had been let off, because their opponents played the routine 6. a3 . It's just as bad with the Knight on c3. Only 11 out of 36 spotted the error. Players mostly in Junior tournaments, one could add. Without looking it up, I assume that 5.....b6??? was the offending howler? Thinking about it, isn't there at least some trappy stuff after 5....Nc6? Yeah there is, and I should at least have played that far, though in fact it's all but child's play to get out of it.